Let me say flat out that Jill and I know nearly nothing about gardening. Given that we’ve bought a farm and are now obliged to cultivate it, our ignorance should be cause for some concern. But, heck, we don’t have time to fret–there’s too much to do. 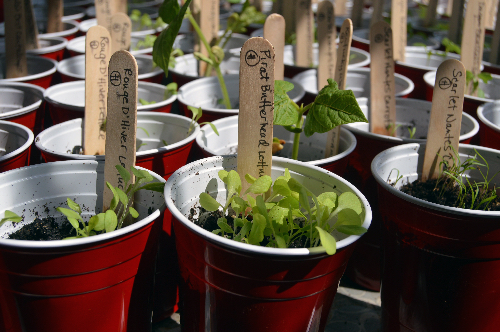 Way back in April, Jill started seedlings–hundreds of plantings in plastic Solo cups, which she kept in our sunny foyer. 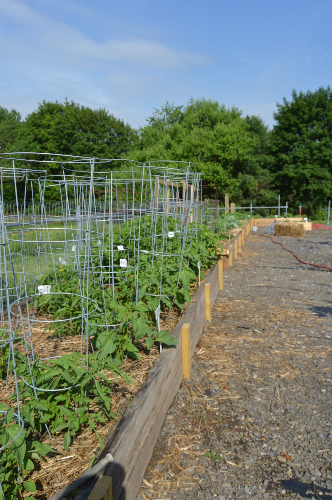 Our learn-as-you-go attitude leaves us wide open, which is to say that Jill couldn’t be sure which seedlings would or would not thrive. We couldn’t plant anything until we prepared the garden. The original kitchen garden was a weedy, bedeviled, thoroughly interesting plot of rogue plantings, interspersed with old rose bushes and tulips and marigolds and other lovely plants that came and went as opportunity allowed. 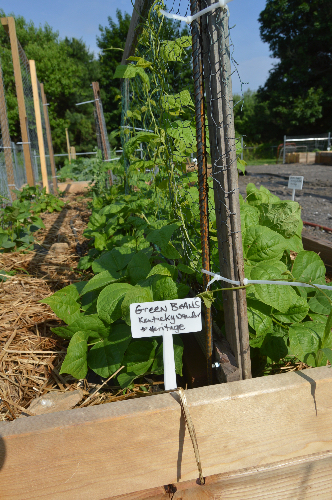 Hidden among the crowd of plants, we sometimes found scallions and parsley and basil; once we found a giant rutabaga. 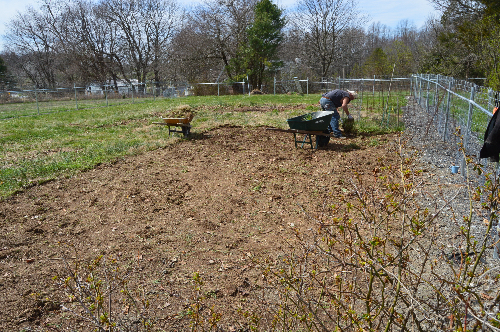 But mostly it was grass and “weeds.” So we got bold and scratched the entire thing: 1) moved all of the old roses to one end, 2) doubled the size of the plantable space (now 70′ x 45′), 3) put in 15 raised beds, each 8 to 14 feet long, four feet wide, and 4) fenced the entire space. It was a lot of work. 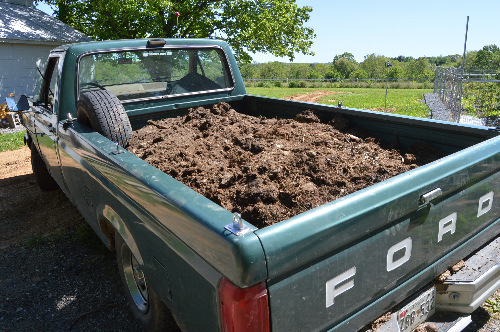 Just filling the beds with topsoil (we had tons from various construction projects), mixing it with horse manure, peat moss, and compost (excavated from the foundation of a ruined chicken house) took days. Clearing the space in preparation for the beds took weeks. My brother, Mike, came for a month to help us plant. He pretty much took over the panting, which made me happy because I had so much else to do. We got lucky. It’s been a cool, wet spring, the result of which is that everything is coming up beautifully. Last summer, our first, was so brutal by comparison that we didn’t know exactly what the farm would yield. 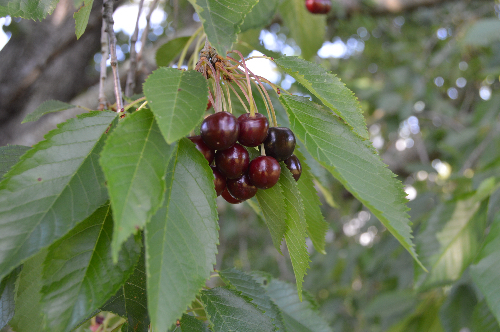 For example: we didn’t know we had a huge cherry tree, 50 feet tall and overladen with fruit. 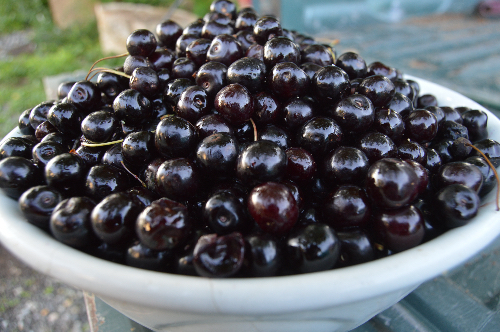 More cherries than we can pick and we got maybe 5% of what the tree holds. 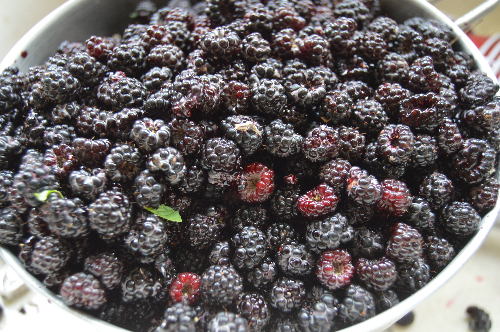 We have a huge thicket of blackberries in the eastern field. Raspberries too (won’t be ready until July). 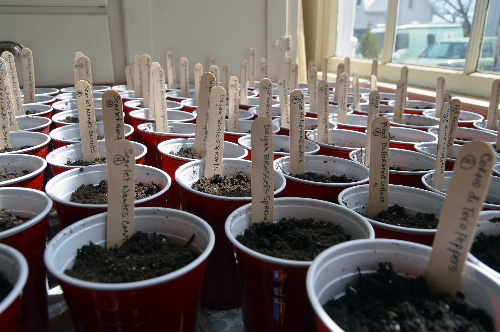 And now the garden is coming up. 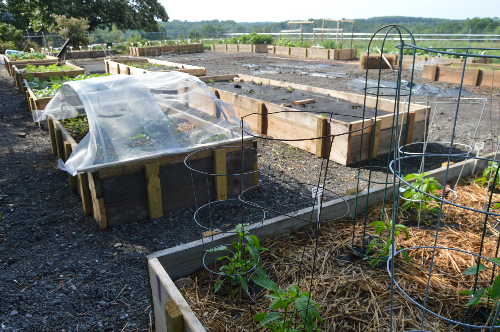 This week we’ve started eating salads from the garden.The ground cloth we put down in each bed does two things: it keeps the cats out (big litter box!) and it keeps the weeds at bay. The biggest problem so far is the caterpillars that are devastating the Brussel sprouts, which, apparently, ,are delectably sweet. You’ve got to pick off the caterpillars one by one and I’m not sure any Brussel sprouts will survive because the caterpillars keep coming. 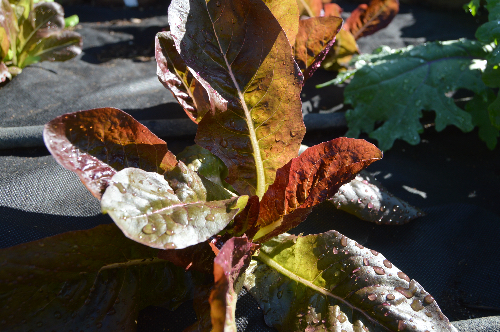 I’ve heard the rule of thumb for gardening is that you should plan to lose 30% to Mother Nature. It’s kind of like taxes.